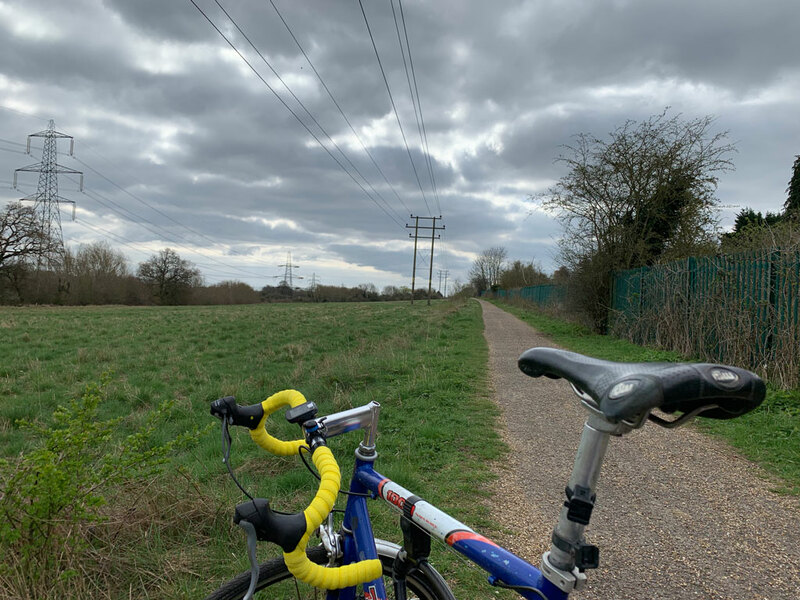 As a road cyclist, I generally turned my nose up at off-road cycle networks – too slow, bumpy and muddy. But I have been cycling around Oxford and enjoyed following bike paths to different venues. This is a cycle path from the River Thames down the back of Kennington and the main-railway. It took me to Sandford Lock, another crossing of the River Thames I had never used before. I have cycled all over the country, but am still finding new routes within a few miles of my home. It was very quiet on this cycle path, and apart from a few trains roaring past, a sense of being deep in the countryside. It’s been a dry March so the path is stone-dry, I don’t know what it would be like after rain. It’definitely has many advantages over the road system. For riding off-road, there are probably better bike set ups than narrow road tyres pumped up to 90psi. I wouldn’t want to cycle all day over this bumpy track. Inspired by cycling around Oxford, I have made efforts to get back on road bike and do some ‘proper’ cycling. It has gone better than I expected and is quite promising. I have been to a private specialist for my hip. He gave a Cortiscoid injection which didn’t seem to make any difference (glad in a way – if you know the history of cycling.) More scans. But, whether due to the long break or something else, I have been able to get back on the bike, with less problems than before. We shall see where it goes. I saw you cycling past my house yesterday. Looked like “proper” cycling :-). Hello Tejvan, great site, I’m a late comer to the joys of cycling up hills and it’s been both inspiring and informative for me. Question, or suggestion for a future post: how much can people typically hope to improve with structured training? I realise the short answer is how long is a piece of string, and lots of assumptions – how much traininging for one – and caveats would be needed, and even with that some people are more traninable than others, some people lose less fitness/have a higher natural base. I think there’s quite a lot of interesting things that could be said on the subject, though. eg How much do you/other people tend to improve from off season to peak form? Or how does off season form compare to fitness before proper training?